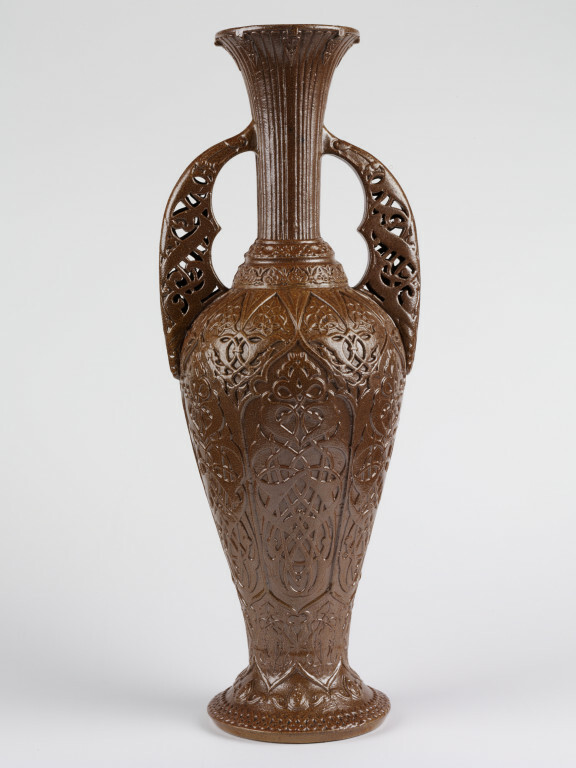 This vase, designed by the French artist and potter Jules Ziegler (1804-1856), was inspired by the shape and decoration of one of the famous 'Alhambra' vases. These were ten fourteenth- early fifteenth century examples recovered at the hilltop site of the Alhambra in Granada in southern Spain. The Alhambra site was much visited and studied in the nineteenth century and images made available to the wider public through prints and publications. This sparked a craze in 'Alhambresque' design. 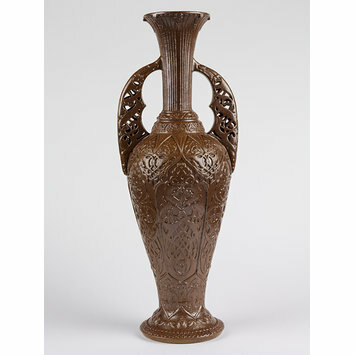 Vase of brown salt-glazed stoneware moulded in relief. Elongated ovoid body with a spreading foot, long narrow neck, expanding mouth, and two openwork wing-like handles. The body is decorated with arabesques in pointed compartments. Vase of brown salt-glazed stoneware moulded in relief, made by Jules-Claude Ziegler, Voisinlieu, 1839-1844. See Object Information File in Ceramics and Glass Dept.